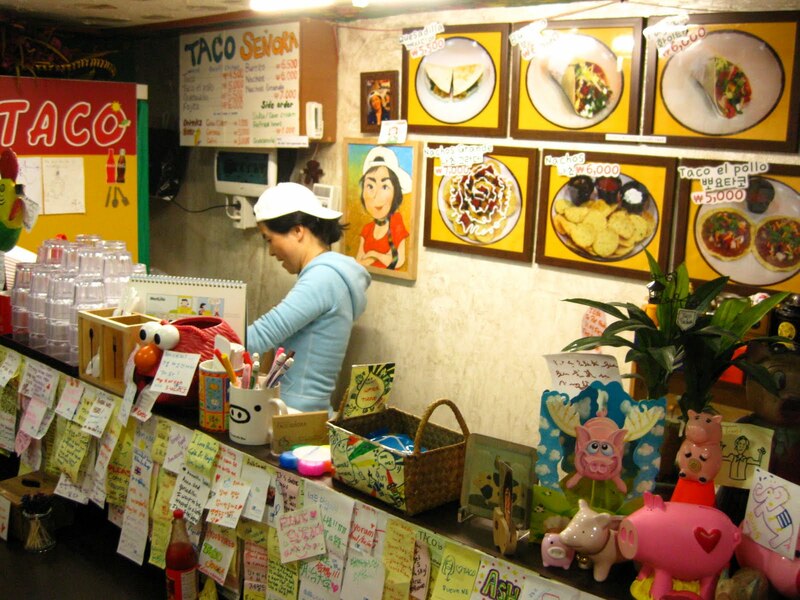 There are two excellent places to go for Mexican food in Busan; Fuzzy Navel and Taco Senora. Everyone knows Fuzzy Navel and their open-front restaurant/bar - they're right on the main drag next to Haeundae Market. They have a good selection of tacos, burritos, chimichangas, and nachos - you can choose from pork, beef, chicken, or bean, and they're all reasonably priced (under 15,000 won) and delicious. You can order sour cream and guacamole on the side. They also have a fully stocked bar and English-speaking waitstaff who are exceedingly friendly. Taco Senora is the more elusive of the pair, as a hole-in-the-wall hiding out in an alleyway across from a Chinese restaurant on the other side of Haeundae Market. It is the stuff of legend - many of the post-it notes tacked to the walls of the tiny restaurant tell tall tales of harrying 8 hour bus rides or worse just to get some of Senora's tacos. And they are pretty damn good - for 7,000 won the burritos are packed full of meat (pork, chicken, beef) or beans, lettuce, tomatoes, onion, and sour cream. The lone woman behind the bar makes everything to order while you wait - and if you go during peak hours there's a good chance you'll be waiting. There is only room for 5 people in the taco shack. From the Busan Aquarium in Haeundae, head East along the main road. Take a left at the first main street; 200 yards down the road on the right you'll find Fuzzy Navel. It's hard to miss. To get to Taco Senora you have to walk a bit further, but not much. Pass Fuzzy Navel and hang right under the Haeundae Market archway. Follow the market street to the end and take a left. Turn right down the first alley you come to. Hopefully the customer line doesn't stretch out that far. If you look down the alley from the street you should see the bright red lanterns of the Chinese restaurant directly across the way. I'm drooling already, have something for me!